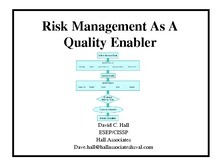 Download "Risk Mgt as a Quality Enabler.pdf"
Download "Comprehensive Risk Assessment Approach.pdf"
Since engineering started mistakes, errors, arrogance and lack of knowledge have plagued the successful accomplishment of all programs. Looking over the last four decades, program developers, program managers, senior management, risk management practitioners and other forward-thinking types have prepared “Lessons Learned” on individual programs. 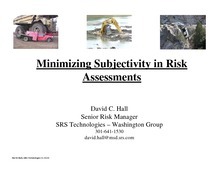 Such “Lessons Learned” reports (or risk identification checklists) have been accomplished on all types of government, industrial and commercial programs, operations and activities and just about everything else. Unfortunately, little use has been made of this valuable data source other than through the experience of personnel who have moved from one program to another. There are some shining examples but, on the whole, very few people seem interested in learning from “Lessons Learned” (or failure data). The Effects of these Causes are program failures. It is obvious from the repetitive nature of these causes that most programs do not take advantage of “Lessons Learned” from prior programs. 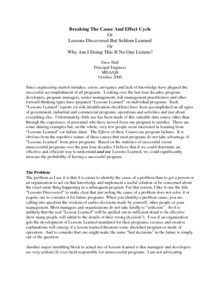 Based on the statistics of successful versus unsuccessful programs over the past four decades, I believe that if we could determine an effective and efficient way to understand and use Lessons Learned, we could significantly increase the probability of having a successful program. 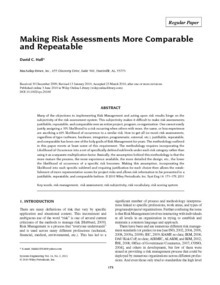 Download "Breaking The Cause And Effect Cycle.pdf"
There is currently an active debate among some risk management practitioners about the definition of risk. 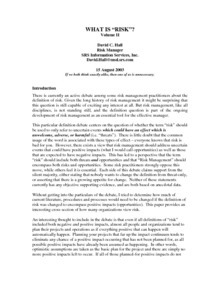 Given the long history of risk management it might be surprising that this question is still capable of exciting any interest at all. 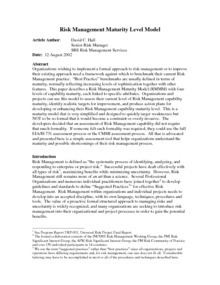 But risk management, like all disciplines, is not standing still, and the definition question is part of the ongoing development of risk management as an essential tool for the effective manager. 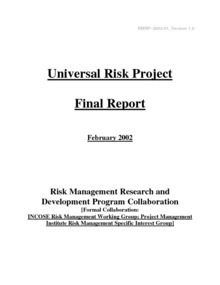 Download "What Is Risk Volume II.pdf"
Download "Using A Risk Management Maturity Level Model Oct 2002.pdf"
Download "Universal RIsk Project Final Report Feb 2002.pdf"